With the holiday season upon us, what better time to take a luxury break and get away from it all — and relax with a few rounds of golf. From volcanic islands to tropical paradises, wildlife sanctuaries and stunning mountain vistas, CNN has sought out courses that cater for the high end of the market. Mission Hills lies in the volcanic region of Hainan Island, China. The resort has 10 courses, with each one incorporating the native lava rock formations. There are also 518 guest rooms and suites, a three-story clubhouse and 12 restaurants in this impressive complex. 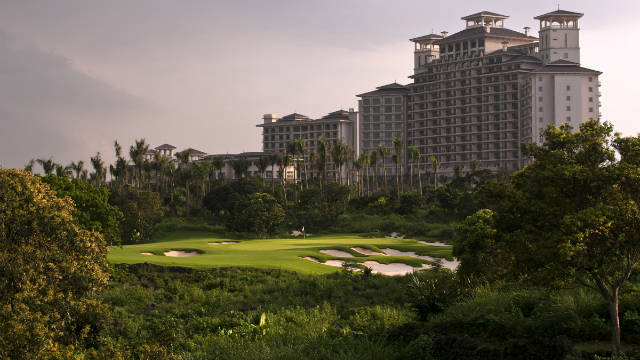 Situated in the volcanic region of Hainan Island, the resort houses a remarkable 10 golf courses, each incorporating the native lava rock formations. There are 518 guest rooms and suites, a three-story clubhouse, 12 restaurants, a fully-equipped sports and recreation center, an aquatic theme park, therapeutic volcanic mineral springs, a spa oasis and a shopping arcade. The Blackstone Course is earning a reputation as one of the world’s finest, and hosted the 2011 World Cup of Golf in November. A premiere suite will set you back a cool $500 a night, while a round of golf is $200. 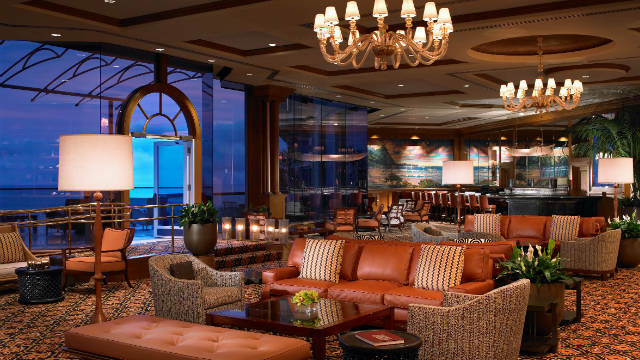 The sumptuous St. Regis bar allows golfers to unwind after 18 holes with beautiful views of the Hawaiian sunset. Great for jazz lovers too, with Sundays traditionally hosting a jam session. Perched on the northern shore of the island, this resort reopened in 2009 after a $100 million refurbishment. There are 252 rooms, of which 51 are ocean-view suites, and the resort incorporates 9,000 acres, providing stunning views of Hanalei Bay and its towering cliffs — the setting for the movie South Pacific. On the golf front, there are 27 holes on the Makai course, with 18 having been completely renovated in 2010. Rooms at St. Regis begin at a cool $375 per night, while the Makai course costs $220 per round. 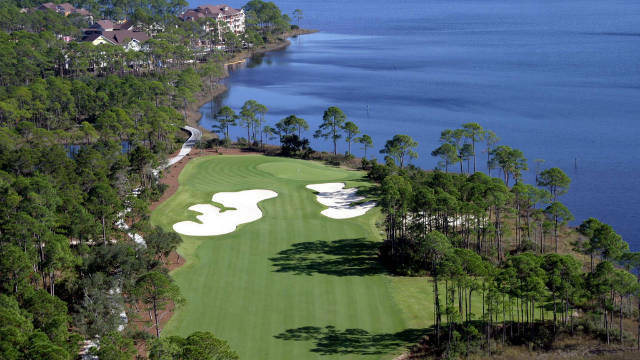 The WaterColor Inn and Resort on Florida’s Gulf of Mexico offers luxurious waterfront accommodation and two 18-hole courses. The Shark’s Tooth, as the name would imply, was designed by Greg Norman and is only available to guests at the resort. Located in the Gulf of Mexico and recently named "Best Hotel in Florida" by the readers of Travel + Leisure, the U.S. resort offers luxurious waterfront accommodation, restaurants, a full-service spa, and two of the sunshine state’s most celebrated golf courses. One of these is Shark’s Tooth, designed by golfing legend Greg Norman, which is a private course only open to guests at the resort. It costs a whopping $525 a night to stay in a beach-view room, with a round of golf at Shark’s Tooth setting you back another $95. Located on the tropical island of Roatan, 35 miles off the coast of Honduras, the Pristine Bay Resort is situated on a 400-plus acre site adjacent to the Caribbean Sea. 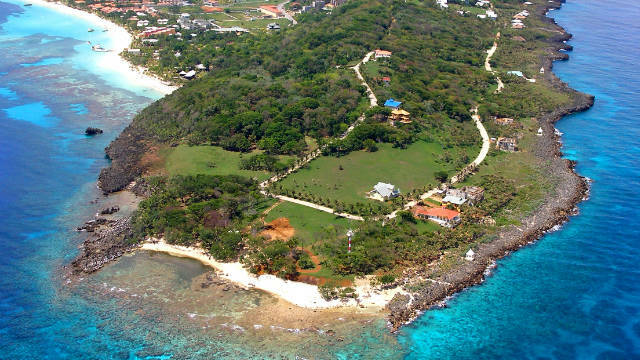 The 120-room, five-star Resort and Spa at Pristine Bay is scheduled to open January 2012. Located on a tropical island 35 miles off the coast of Honduras, the new Pristine Bay Resort is situated on a 400-plus-acre site adjacent to the Caribbean Sea. The world’s second-largest barrier reef provides a stunning backdrop to the Black Pearl Course, with the 120-room resort scheduled to open January 2012. Residents and guests will have access to the ocean-front Bay Village with boutiques, art galleries, restaurants, cafes and other entertainment options. The cheapest rooms start at $300 a night, with a round of golf coming in at $150. The Jasper Park Lodge Golf Club has been rated as the best golf resort in Canada by SCOREGolf Magazine. Originally opened in 1925, it is located deep in the heat of the Canadian Rockies in a UNESCO World Heritage Site. 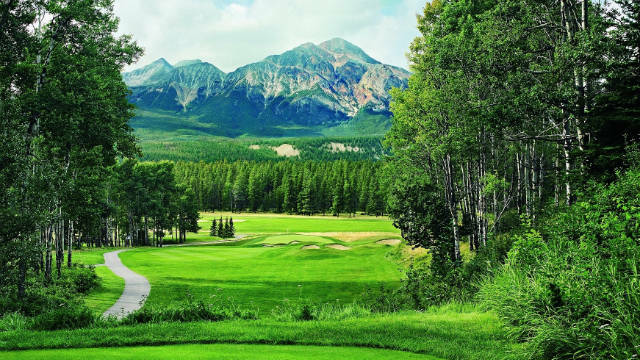 Set in the heart of the Rockies, this beautiful course is rated by SCOREGolf Magazine as the number one golfing resort in Canada. Elk, deer and wildlife are able to roam free on the UNESCO World Heritage Site, which opened in 1925. Between May and October, the resort offers the "Ultimate Buddy Trip" for eight or more people. At $3,125 per person it isn’t cheap, but for your money you get a three-day/two-night stay in Milligan Manor — the largest luxury cabin at Jasper Park Lodge — two rounds of golf, a fly fishing excursion, whiskey tasting and a private outdoor barbecue with your own chef.